Well we have done it! Almost a year on and Firhall Highland Bed and Breakfast has risen from the dust of a 12-month renovation project and, as a family, we have just about survived it too. We look back on a year working on this project and what the future holds. Who would have thought that, on that sunny day back in March 2016, we would open the door to this old house and to the hilarious ups and downs that this renovation project has put us through. But that’s precisely what has happened. We collected the key from our local estate agent and I thought holy moly, it was like the key to a castle! Walking in for that first time I remember looking around at the beautiful wood panelling and fireplaces and thinking yes, it still has the soul of the house. However, upon trying to use the bathrooms that feeling quickly turned to dread as we realised, only one of the eight bathrooms was functional! Suddenly I was Goldie Horn in that movie ‘The Money Pit’ and I knew this was going to be a testing year! But, not unlike that movie, it was also a hilarious one too! We quickly got to work ripping out tons of laminate flooring, all but one of the bathroom suites, quite a few walls, the old radiators and the entire kitchen, including the original lath and plaster walls. Now, it being March in the highlands, it was of course -7 degrees Celsius. With no heating at all at this point, fully clothed underneath a onesie, two duvets and a blanket, trying to sleep with ice on the inside of the windows, I did start to think what on earth have we done!!! But, after months of replacing the plumbing, rewiring the electrics, putting up new walls, painting, wallpapering, landscaping the gardens, installing log burners and brand new bathrooms, it has all been worth it. We were so lucky to have so many skills in the family and to have worked with some great local tradesmen, to complete this project. Firhall opened for guests on the 14th September 2016 and since then has welcomed guests from all over the world. Our first guests that night were from Malaysia and Germany. Since then we have hosted couples from as far afield as Australia and Canada. All guests come with different adventures planned here in the Scottish Highlands and leave having found lots more unexpected excursions too. The guests have loved the individuality of each of our rooms and comment on the attention to detail and quality of the items we have selected. So much thought and research has gone into every single aspect of the house, so we are very pleased to hear that the guests are getting the benefit of all that time and effort. Works are about to be completed on the renovation of our last guest bedroom this month, the Hare Room. Check back later in the month to find out all about this new addition to Firhall Guest House. Following this, we look forward to our first full season of running this labour of love and then, later in the year beginning the renovation of the servants’ quarters. Living under the stairs like Harry Potter only has its charms for a limited time, especially at the age of 33! 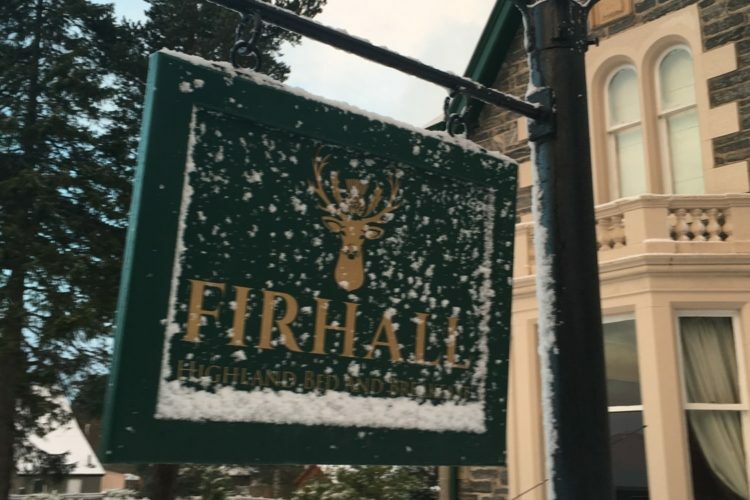 Until then, we can look forward to a season of guests from far and wide, enjoying what this stunning area has to offer with a taste of homely luxury here at Firhall Highland Bed and Breakfast. Don’t forget, that for the best offers and deals always check our website Book Now page for availability and don’t forget to subscribe to get our latest news and offers direct to you. Now back to scrubbing the floors like Cinderella.